Despite the declared 2020 Democratic presidential field being the most diverse and female in history, more than half of primary voters in a new poll prefer two elderly white men who aren't officially in the race. A Morning Consult poll showed former Vice President Joe Biden with 29 percent support among Democratic primary voters and Sen. Bernie Sanders (I., Vt.) next with 22 percent. Rounding out the top five were Sen. Kamala Harris (D., Calif.) at 13 percent, Sen. Elizabeth Warren (D., Mass.) at 8 percent, and former Rep. Beto O'Rourke (D., Texas) at 7 percent. Like Biden and Sanders, O'Rourke has been considering a bid but has not filed any paperwork for a campaign or even an exploratory committee. The numbers are even starker for Democratic voters in the early-primary states Iowa, New Hampshire, Nevada and South Carolina. 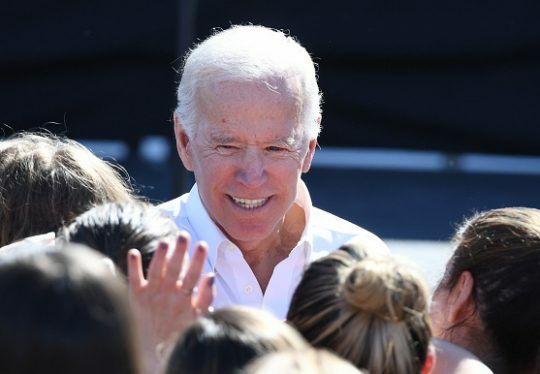 Biden leads with 33 percent, followed by Sanders (21 percent), Harris (11), Warren (10) and Sen. Cory Booker (D., N.J.) (6). The Democratic primary field includes multiple women for the first time, including Harris, Warren, Sen. Kirsten Gillibrand (D., N.Y.) and Sen. Amy Klobuchar (D., Minn.). It also has several minority candidates: Harris and Booker are African American, and former Obama administration official Julián Castro is Hispanic. Sanders ran in 2016 and mounted a surprisingly strong challenge to Hillary Clinton, although he ultimately fell short. Biden thought about running that year but chose not to in the end, in part due to the death in 2015 of his son Beau and the grief he felt at that time. Biden (78 percent favorability) and Sanders (72 percent) were by far the most well-liked in the poll. This entry was posted in Politics and tagged 2020 Election, Bernie Sanders, Democratic Party, Joe Biden. Bookmark the permalink.